When electric power was in its infancy, there was a debate on how exactly to light up a city. Today we have settled on streetlights lining the sidewalks, but once upon a time, they had giant towers that re-created the moon. Find out about Moonlight Towers, the last city in the world that has them, and the perpetual daylight that might have been. Right now, the biggest hassle most people face when it comes to electricity is finding a converter when they go to another country. Electric power flows everywhere in cities and in the country, so it's easy to forget that it was once an untested technology that would require a massive overhaul of infrastructure if it was going to be of any practical use. It's not surprising that wiring up every gas lamp in town, or in some cases constructing streetlights that regularly line every street of a still-developing town, was too big a risk. Instead of a lot of little lights that kept the streets bright, towns turned to Moonlight Towers. These were massive towers, three hundred feet high, that had arc lamps at the top of them. Arc lamps were the precursors to the widespread use of the modern electric bulb. In the modern incandescent light bulb, electricity runs through a tiny filament, which glows hot but doesn't manage to burn up because the inside of the bulb lacks the oxygen necessary for combustion. Arc lamps didn't have the filament. They were invented in the mid-eighteen hundreds by Sir Humphry Davy, who connected up a couple of bits of charcoal to a battery and brought them close together to make a circuit. Just before the charcoal bits touched, light jumped between them. It took several more decades of experimenting with bits of carbon (like the charcoal), electrical set-ups, to produce a useful model. The most infamous arc light was the Yablochkov candle. Made by Paul Yablachkov, it was cheap and spectacular, because it had a guide wire that first started the arc between the carbon pieces when the lamp was lit. The wire then burned up in the air, leaving the free-flowing arc of electricity behind it. It was a crowd-pleaser, and it anticipated the modern light bulb. The only problem was, it could never be turned off, or the whole thing had to be replaced. As the 1890s rolled around, arc lamps were finally getting practical. But they needed to be out of the way, far from people's heads — and so cities began putting them on specially-built towers and in the tallest structures in city squares. They lit up several blocks at a time, were called 'artificial sunlight,' and were bright enough that people would set newspapers on the ground and read the headlines standing. In cities that didn't have the capacity to build sky-scrapers which could block out the light, these were the future. They kept the day going into the night, and they made people feel safe. The very first Moonlight Tower went up in 1881, in San Jose, California - which tried to sue Paris when someone eventually put an arc lamp on the Eiffel Tower. Across the nation, other towns and cities followed suit. Detroit put up 122 towers, which lit 21 square miles of the city bright as day. It was held up to be the best example of a modern city. Other cities wouldn't let that stand, and by the early 1900s hundreds of thousands of lamps stood over American towns, blotting out the stars with constant approximations of daylight. Europe put up arc lamps in towers and on the tops of buildings. This is what the future was going to be like, people thought. It was the later successes of electric power that edged out the earlier one. Gigantic, battery-powered arc lamps just weren't as necessary, once power companies had laid down the grid that could light up every house on every street in America. If the houses were going to be powered individually, might as well put in street lamps so that the streets could be powered individually as well. Little by little, towers started coming down. Only one city in the world maintains a tower system today. Austin, Texas has seventeen towers, all that remains of the thirty-one towers they brought in just at the end of the 1800s. 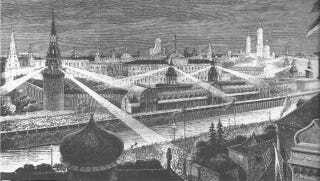 The city was still clamoring for better public safety after a series of murders by a killer dubbed The Servant Girl Annihilator (thought to be a man named Maurice who left for London just before the Jack the Ripper murders started up), and officials thought lighting the streets would help. The entire arrangement was maintained and updated into the 1940s, by which time most other Moonlight Towers across the country had been taken down. Austin didn't follow their lead, and merely installed a system that would shut off all the towers at once in case of air raids. Slowly, peripheral towers came down, and two towers had to be moved for construction on the downtown area. Still, these are the last working towers in the world. Austinites and tourists can take a look at them at night, and see the world as it once could have been. Via Magnet Lab, Austin Postcard, Republic of Austen, and Low-Tech Magazine.